In the near future the company, Monad, has revolutionized AI to the point where some people believe it came from the future. Nelson just wants to be a good family man and provide for his family and help his friend get a job to do the same. Unfortunately he gets caught up in a war, not just between the rival companies Monad and Dyad, but also between the AIs called Red Men and their real life counterparts. This was an interesting book. It felt like it was modeled after a 70's drug-trip dystopian movie. It goes back and forth between Nelson's perspective and his friend Raymond's with a couple other minor characters as well. I greatly appreciated Nelson's everyman perspective. He is genuinely a good person who wants to do the right thing, but wants to put his family's well being above all. I kinda wish we could've gotten to see the world from the perspective of a Dr. Easy robot. We got a monologue from the main AI, but I the things that the Dr. robots have to go through would have been really interesting. It took longer to read than I expected, and I felt frustrated with that at a few points, bored at others, but the ending was really worth it. I finished the book feeling like I had spent my time well. There were a few time jumps that I had a little trouble following, but overall the story was well paced with the occasional needed humor, there was just a lot of story. And this is the edition that had some stuff removed! 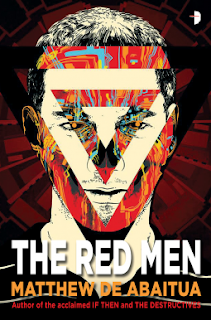 If you like corporate dystopia books or drug-trip books, you'll really enjoy The Red Men. I greatly appreciated the philosophical/ethical discourse about those who conquer, those who fight and those who remain quiet. I kinda wish this wasn't such a book for our times, but it's got some good messages for the world today.